India is the largest democracy in the world. The name India is however given by the foreigners. The original name is “Bharat” (भारत) and that’s why it is officially written as Republic of India in English and भारत गणराज्य in Hindi. The name भारत is a tribute to the great King Bharat from the Chandravansh clan. He was the one who brought in the concept of a Nation and weaved the tapestry of various states into the nation – भारत. This great king had great parents and there is a lot written about them as well. His mother Shakuntala was the daughter of Sage Vishwamitra (the first and only non-brahmin Brahmarshi) and celestial nymph Menaka, raised by sage Kanva. His father Dushyant (aka Dushyanta) was a great king of Hastinapur who was a fantastic administrator and ferocious warrior. I think the following books will interest you to know more about these characters. The stories are related to Mahabharat (aka Mahabharata) as it was Bharat whose descendants fought the great war of Mahabharat against each other! 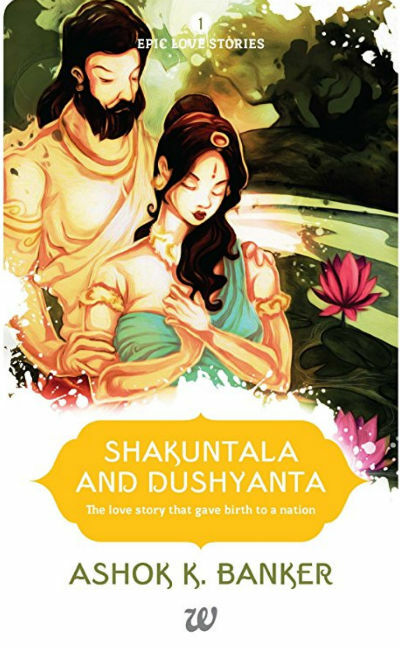 Today, however, let us talk about the Epic Love Story of Shakuntala and Dushyanta explored by author Ashok K Banker in the form of a short story. How many times have you experienced that you are attracted to a book simply by its cover? Well, when you are exploring a large display of books, it is the cover page which comes into your eye-contact right? And it makes the first impression which lasts for long. Of course, the cover page is (and should not be considered) as the only factor to judge a book. You, however, cannot ignore its influence on the purchase and reading decisions too. As you can see, the cover page is fairly attractive. It has illustrations of Dushyanta and Shakuntala in an intimate pose. Actually, the author has penned five books in “Epic Love Stories” series, and you can find a large number of similarities in the illustrations of the characters in all them. This is the first book in the series in terms of reading order. The characters are not facing each other, but still, you can feel they are looking at and thinking about each other. The illustration of lotus flowers and other stuff shouts that it is a snapshot taken from their meeting at a beautiful natural place near Sage Kanva’s Ashram in the jungle. An impressive cover page, I can say. It all starts with one of the hunting escapades of Dushyanta, the king of Hastinapur. It was the favorite pass time (or hobby) of the king (and many more, yet to be born, in his lineage). This hunting experience was really fantastic in the beginning and it raised the adrenaline in the king, and in the ecstasy, he got deeper and deeper into the jungle. But, everything doesn’t go as per the plan, and that’s why we call it a “fate”. The jungle keeps getting more and denser and eventually, the sources of water started disappearing. The Sun is also playing its role and the king was reluctant to find water by getting even deeper in the jungle. It resulted in thinning his convoy (including men and animals both). And, he himself was also in the desperate need of water, the primary source of life, after the air. When he was about to lose all hopes, he found a beautiful place, a jungle within the jungle. It is a charming place where he saw hunting and hunted animals drinking water together from a source. No one is a predator and no one is prey there! And, he meets with Shakuntala there. How? And, what would be the outcome of their meeting? How a chain of incidents started from here and how it is resulted in “then they lived together ever after” moment? You can read this fictional book to get the answer(s). When you write about anything related to Mahabharata (or any other Indian Epic) you are tempted to cover many things, points, and aspects from many stories from different timelines. The author, however, has wisely drawn a boundary and remain focused on the incidents directly connected to the love story of both the protagonists, Shakuntala and Dushyanta. Everything and everyone else took a backseat. And, that works in favor of the book. The author is good at exploring nature convincingly. In this short EBook, he shows both the side of nature, the beauty and the anger. No, there are no natural calamities explored in the book. But, whatever happened in the Jungle with the king and his convoy is something very similar we are experiencing slowly in the current time, and possibly a harsh future is waiting for us, if we don’t understand now. Anyway, let us stick to book, and let me share the lines I found really fascinating when it comes to showing the anger of the jungle. The forest had its revenge on the invading force. The riverbeds were parched, the ponds dry. Not a drop of water was to be found for miles and miles. Search as they may, they could find no trace of water, running or still. Surely the animals must stake their thirst somehow. But the animals could not speak, nor did the forest yield its secret. The very idea of considering the forest as a character amazing. His enemies feared him enough to show great respect and avoid confrontation – those that were foolish enough to oppose him in battle met with devastation and ruin, and were massacred or enslaved. See how infatuated yet hesitated she is. She is in a dilemma where she wants to trust the king but her conscious says her to wait for her father’s consent. Her father is the only person (or for that matter, for any girl, her father is the only person) whom she is looking as an icon and most trustable person. And in his mind, he thought, This is truly my daughter. Even at such a moment, she did not ask for anything for herself. Only for her husband. Dushyanta is a lucky man to have her as his wife. Not for nothing is Yama lord of dharma as well as death. She was an island of dharma in an ocean of injustice. The swan, on the other hand, seeks to separate milk from water to drink it. Similarly, the wise seek words of wisdom and quality when listening to other people speak. They ignore the bad or ignoble words and phrases and pluck out only for good, separating them from the rest like wheat from chaff. Fools take great pleasure in berating wise men. Wise men keep silent when confronted by fools, choosing rather to walk away than engage them in puerile arguments. It is a fact of life that the truly evil person always insists that he is truly good and that those who are genuinely good are truly evil! Even in exile, a wife refreshes her husband when all else is lost. Thus did kingship change men from flesh and blood to iron and gold with hearts of steel. The honest person is always predictable for he or she will always do what is right! So, by now you must have got an idea about the quality of writing in the book. The characters are well defined and gradually they show different layers. Some readers may think that the author has tried to favor Dushyanta by giving logical reasons and enabling him to justify what he did. This book (and all of the 5 books in the series) are filled in with श्रंगार रस. Of course, the author keeps a fine line and never let it be erotica. But, consent is required to read it. Love stories are meant to be explored by the mature (mentally) people, anyway. I bought it during a book promotion and thus it is the best “value for money” for me. And, I will suggest you look for various offers (which we regularly share on our social media handles as well) and you will find the best time to purchase it. Overall, it is a swift read which takes you to the journey of ancient times. If you already know (and you must) the story of Dushyanta and Shakuntala then also, you will love exploring this version.